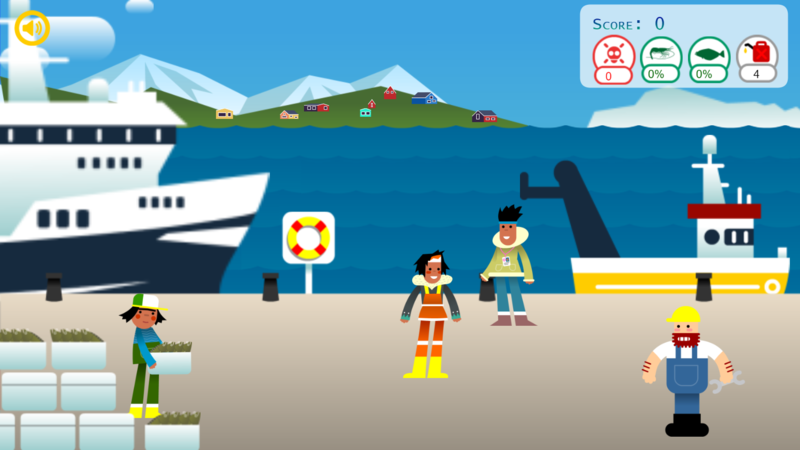 A new game created by scientists at international conservation charity ZSL (Zoological Society of London) aims to educate children on how seabed trawling is damaging to marine wildlife off the Greenland coast. Casting their nets far and wide, players of ‘Tricky Trawling’ must attempt to catch fish out in the open ocean, while avoiding vulnerable seabed-dwelling creatures like octopus, skate and bubble-gum corals in this fun game with a serious message. Highlighting the damage caused by bottom trawling – a specific method of fishing involving dragging a heavy net across the seabed – the game demonstrates the negative impact this method has on the marine environment. Dr Chris Yesson, Research Fellow at ZSL and creator of the game said: “The ‘Tricky Trawling’ game puts players in control of a fishing boat and a net, with the aim of collecting valuable fish on the seabed without damaging vulnerable habitats. “Seafood products account for more than 80 percent of Greenland’s exports, so protecting vulnerable seabed habitats is vital for the ecosystem health and long-term sustainability of the fishing industry, but protection requires public awareness and support. “We recognise that young people today are very aware of the impacts they have on the environment and are keen to minimise negative impacts as much as they can. We’re hoping this game will inspire them to influence the purchasing choices of the adults in their lives. Many animals featured in the game like sponges and corals build delicate frameworks across the seafloor but because they’re stationary cannot escape the trawl path. Others species are slow growers, with some estimated to be over 800 years old, making them extremely vulnerable to trawling. Dr Mona M. Fuhrmann, Postdoctoral Researcher at ZSL, who provided local knowledge and scientific input into the game said: “The deep-sea floor of West Greenland is full of interesting and diverse animals, but sadly has been extensively trawled over recent years. Coral habitats have been damaged and reduced by decades of trawling and it could take decades or longer for areas to recover, while some species may never fully recover. “For example, bubblegum corals were once a relatively common sight in the area but are now difficult to find with deep-sea trawling likely the key cause of their decline.